Police are hunting a masked man who fired a crossbow bolt at a van in Co Antrim. It happened on the forecourt of a Carrickfergus petrol station on Tuesday. Two men who were in the black Renault Trafic van escaped uninjured but minor damage was caused to the vehicle. The incident happened at about 5.15pm at a petrol station on Prince Andrew Way. 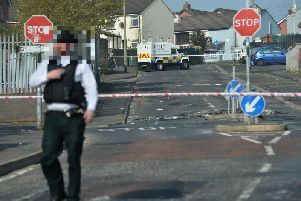 Anyone with information has been asked to contact detectives from the Police Service of Northern Ireland’s reactive and organised crime unit on 101.